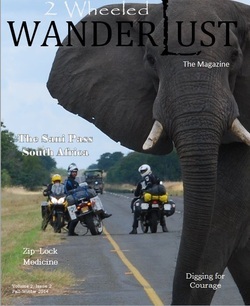 A subscription driven adventure lifestyle magazine for the 2 wheeled addict in us ALL! 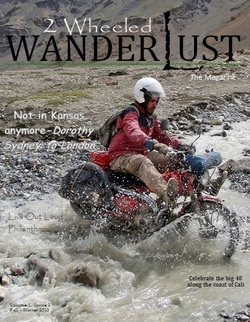 Our first issue premiered at Overland Expo in May 2013 to great avail and Fall - Winter premiered at Horizons Unlimited in Oct. 2013, We are proud to have subscribers on 3 continents and in 4 countries. **to be noted**- Subscriptions currently on hold - 2WW will become a free digital -back issue magazine in Sept. 2015 - currently taking no new subscriptions. 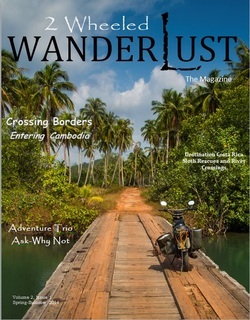 We are excited to boast -- Subscribers on a National and International level: Australia, Canada, Italy - California, Washington, Arizona, New Jersey, Iowa, Hawaii, Oregon, Colorado, Michigan, Nebraska, Texas-and more...Digital subscribers--Living at large in the world on the road! Danell Lynn recounts this past summers trip to Cuba, and flip-flop riding in Cienfuegos. Kris' Traveling Kitchen prepares you for the cooler weather and soups for the season.